The former Liverpool defender can’t see the Colombian international being signed permanently by Manchester United. 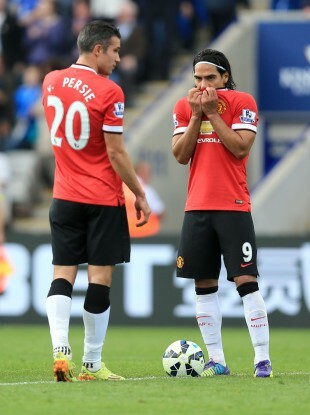 United forwards Van Persie and Falcao. JAMIE CARRAGHER BELIEVES Manchester United United have got serious issues in the striking department. The Red Devils needed a late goal from Daley Blind to rescue a point away to West Ham in yesterday’s 1-1 draw – with front two Robin van Persie and Radamel Falcao failing to score and Wayne Rooney again deployed in midfield. Sky Sports pundit Carragher doesn’t envisage Colombian Falcao staying beyond his loan period, which expires in the summer, while he was critical of Louis van Gaal’s decision to play his captain in a deeper role. “I think Louis van Gaal has got a problem with his strike force,” Carragher said on Sky Sports yesterday. “I don’t see Falcao staying at the end of the season and it’s something Manchester United will have to address in the striking department. “West Ham showed pace and energy through Sakho and Valencia in the first half to get in behind the United defence. But Falcao and Van Persie failed to exploit the same spaces. “They were just jogging up field, especially Van Persie, ambling up and they didn’t cause a make-shift West Ham back four enough problems. “When United were in the wide areas, Falcao was ball-watching and that made him easy to mark. He should have been running down the channels. There is not enough movement from the front two, there’s no sprint, spark or energy and that was in complete contrast to West Ham. “United have got big problems at that end of the pitch,” he added. “Everybody talks about United needing a centre back and that defensively they’re all over the place, but they’ve got one of the best defensive records in the league. “Granted, a lot of that is down to the goalkeeper, but the problems are at the other end of the pitch and there’s no way I see Falcao staying. The position of Rooney is not right. He only touched the ball in the opposition’s box once or twice and he’s playing like a defensive midfield player. Email “Carragher: Falcao & Van Persie partnership doesn't work, Rooney wasted in midfield”. Feedback on “Carragher: Falcao & Van Persie partnership doesn't work, Rooney wasted in midfield”.